There are a myriad of treatments for ureteropelvic junction obstruction. Open pyeloplasty is associated with the highest success rate, up to 95% (1). Unfortunately, it requires a sizeable muscle incision and is associated with considerable postoperative pain and convalescence. Since the 1980s, various techniques of antegrade and retrograde endopyelotomy were introduced as less invasive treatment options for primary and secondary ureteropelvic junction obstruction. While these techniques are faster and less morbid than open surgery, overall success rates for all endopyelotomy techniques remain lower than those for open pyeloplasty (2). In an attempt to merge the high success rates of pyeloplasty with the advantages of minimally invasive surgery, the techniques of laparoscopic pyeloplasty were developed. These techniques report success rates comparable to open pyeloplasty without the morbidity of a large flank incision (3). Unfortunately, there is a steep learning curve associated with this approach and despite advancements in instrumentation, laparo-scopic pyeloplasty remains one of the more difficult procedures performed by urologists. Robotics has been applied to pyeloplasty in an attempt to simplify the laparoscopic technique yet maintain the benefits of minimally invasive surgery. Telerobotic laparoscopic pyeloplasty has been performed in the animal model and clinically. Sung et al. first evaluated efficacy and feasibility of robotic dismembered pyeloplasty in the animal model (4). In the study, five female farm pigs were prospectively randomized and laparoscopic pyeloplasty performed with or without the Zeus robotic system. When comparing robotic procedures to conventional laparoscopy, no significant differences in operative time, suturing time, or total number of suture bites per ureter were reported (4). Sung et al. concluded that the Zeus-assisted robotic approach was feasible and could be used for clinical application. In the experimental model, Sung and Gill subsequently compared laparoscopic pyeloplasty performed with either the Zeus robotic system or the da Vinci robotic system. They found that da Vinci-assisted pyeloplasties were associated with shorter overall operative times, shorter anastomotic times, and an increased number of suture bites per ureter (5). The conclusion was either system could be used for robotic pyeloplasty; however, the researchers thought that the da Vinci robotic system was more intuitive. 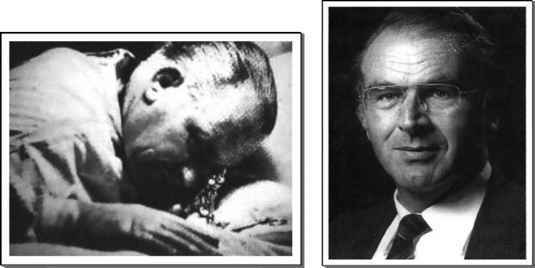 These early experimental studies at Cleveland Clinic provided a foundation for clinic application of robotic pyeloplasty. Robot-assisted laparoscopic pyeloplasty has been performed clinically using either the da Vinci robotic system or the Zeus robotic system (6-9). The only system currently supported for performance of robotic pyeloplasty is the da Vinci robotic system. The indications for robotic pyeloplasty are the same as those described for the conventional laparoscopic technique. Robotic pyeloplasty can be performed for patients with both primary and secondary ureteropelvic junction obstruction. In addition, robotic pyeloplasty can be safely performed in the presence of crossing vessels, a redundant renal pelvis, and intrinsic or extrinsic obstruction (6-9). Patients that have previously failed open pyeloplasty are not ideal candidates for this procedure. In addition, patients with poorly functioning obstructed kidney and those with a relatively small intrarenal pelvis are not ideal candidates. The most commonly performed technique for robotic pyeloplasty utilizes the da Vinci robotic system. 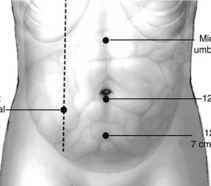 The procedure is performed using four transperitoneal ports with the patient in a 45° lateral decubitus position (Fig. 1). A standard 12 mm port is inserted at the umbilicus for placement of the laparoscope. Two 8 mm robotic ports are then placed as well as another standard 12 mm laparoscopic port for the assistant surgeon. The robotic system is then installed, and all operative steps are performed solely using the da Vinci robotic system. For renal exposure, the line of Toldt is incised and the large intestine is retracted medially. While mobilization of the descending colon is commonly preferred for exposure of the left ureteropelvic junction obstruction, a transmesenteric approach has also been described for thin patients. Exposure of the ureteropelvic junction obstruction is commonly performed using a Prograsp or Cadiere forceps on the left robotic arm and the hook electrode on the right robotic arm. Next, either a nondis-membered Fenger-plasty or an Anderson-Hynes-dismembered pyeloplasty is performed based on the type of ureteropelvic junction obstruction encountered. Regardless of the technique utilized, the surgical indication and the operative steps of robotic pyeloplasty mirror the steps described for conventional laparoscopic pyeloplasty. During the pyeloplasty procedure, a 7 French double pigtail stent is placed in an antegrade fashion over a guidewire into the ureter via the 12 mm assistant port (6,7). Once the ureteropelvic junction repair is completed, displaced bowel is then repositioned anatomically and secured using 4-0 vicryl suture. Placement of a surgical drain is recommended only in certain surgical situations and is up to the discretion of the individual surgeon. The ureteral stents are left in place for six weeks, at which time they are removed via a cystoscopic approach. Clinical experience with robotic pyeloplasty is limited but encouraging. Based on an initial report of nine patients undergoing laparoscopic Anderson-Hynes pyeloplasty with the da Vinci system, Gettman et al. reported a mean operative time of 139 minutes, mean suturing time of 62 minutes, and a 100% success rate at short-term follow-up (6). FIGURE 1 ■ Port placement for robotic-assisted pyeloplasty. The 12-mm port for the camera is placed at the umbilicus. The 8-mm robotic ports are placed midway between the umbilicus and xiphoid in the midline and pararectally just below the level of the umbilicus. The 12-mm assistant port is placed at least 5 cm below the umbilicus in the midline. Robot-assisted procedures have also been reported as advantageous when compared to traditional laparoscopic pyeloplasty with regards to mean operative time and mean suturing time (7). When patients undergoing da Vinci-assisted laparoscopic Fenger-plasty or Anderson-Hynes pyeloplasty were compared to patients undergoing purely laparoscopic procedure, the da Vinci-assisted procedures were associated with shorter operative times and decreased suturing times. Furthermore, the magnitude of improvement was greatest for patients treated with the more difficult Anderson-Hynes repair (7). A report by Bentas et al. further supports the clinical applicability of robotic pyeloplasty. In this series, 11 patients underwent a da Vinci-assisted laparoscopic Anderson-Hynes pyeloplasty with no intraoperative complications or open conversions (8). At one-year follow-up, the group reported 100% success rate. Interestingly, the group from Frankfurt had no formal training in laparoscopic surgery before successfully embarking on these types of robotic procedures. Robotic pyeloplasty appears to be gaining momentum as a definitive treatment of ureteropelvic junction obstruction. The use of robotics negates most of the technical disadvantages associated with the traditional laparoscopic procedure, yet still provides a successful, minimally invasive treatment. Additional clinical experience, however, is needed from investigators at multiple centers with varying degrees of laparoscopic experience to define the exact role of robotic pyeloplasty among other treatment options for ureteropelvic junction obstruction.